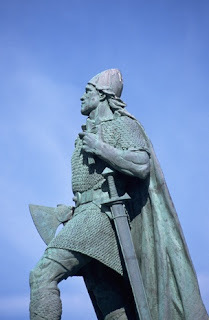 Leif Ericson was born sometime in the 1070s in Iceland, where his parents, Erik the Red and Thjodhild, met. Ericson's grandfather, Thorvald Asvaldsson, had been banished from Norway for manslaughter. Following his path, Ericson's father, Erik the Red, had gotten himself banished from Iceland for the same reason. When Erik was banished in 986, Leif went along with him to Greenland, where he grew up in the colony of Tyrker. In 999, Ericson traveled from Greenland to Norway, but he got blown of course and had to spend several months in the Hebride archipelago. While in the Hebrides, he met noblewoman Thorgunna, with whom Leif had a child, Thorgils, with. When he made it to Norway, he became the hirdman, or armed companion, of King Olaf Tryggvason. While in Norway, Ericson converted to Christianity and was given the mission to bring Christianity to Greenland. From here, two separate stories of Ericson's life start. One story, from the Book of Icelanders, states that while on his way to Greenland as a missionary, he was blown of course towards America. The other story, found in the Saga of the Greenlanders, states that Leif heard the story of Bjarni Herjolfsson, a Norse merchant who claimed to have seen land west of Greenland. Leif, with a boat and crew, went off in search of this land. Either way, Leif went west of Greenland, landing on three different islands. First, he found a rocky, desolate place he called Helluland, which was probably Baffin Island. He then found a forested island he called Markland, which was most likely the island of Labrador. Finally, in 1001, he found Vinland, which was most likely Newfoundland, which he named after the abundance of grapes, which were probably just berries. On Vinland, Ericson founded a settlement called Leifsbudir, which, after a little while, was abandoned, most likely due to strained relations with local Native Americans. It is unknown how Ericson died, but it was probably around the year 1020 in Greenland. Ericson is on our list because of his claim to the discovery of America. His claim to the throne is about 500 years earlier than Columbus.